Although often considered a distinct format by collectors and scholars, in many ways the story paper and dime novel are virtually inseperable. Story papers are newspapers that feature serialized fiction, or stories issued in chapters over several issues. This format pre-existed Beadle's Dime Novels by as many as 30 years and continued to thrive well into the dime novel era. Although often considered a distinct format by collectors and scholars, in many ways the story paper and dime novel are virtually inseperable: most dime novel publishers also published story papers and many stories published in dime novels were originally serialized in story papers. The most important distinction is that fiction in the story paper is serialized, while every dime novel contains at least one complete novel-length story. Another format, the pamphlet novel, also pre-dates the dime novel, offering inexpensive, complete novels under paper covers for the first time. As news dailies developed in the big cities during the mid-1830s, some weekly newspapers began to specialize in serialized fiction, which would often accompanied by news items of local interest and advertisements. These are sometimes called "literary weeklies" or simply "weeklies." Towards the end of the decade, “mammoths,” which consisted chiefly of fiction, grew in popularity, so-called because their dimensions dwarfed those of conventional newspapers. The largest of these, the Universal Yankee Nation (1841-1842), took up more than 8,450 square inches and was nearly 11 feet tall. Printing mammoths was significantly more expensive than printing conventional newspapers, however, and the fad died out by 1844. 1854 holiday issue of Brother Jonathan, which measures more than 29 in. by length. Digitized by Digital Library@Villanova University. A literary weekly or mammoth might feature the occasional prize-winning story of original fiction, but most of the contents were pirated European serials. This was possible because there were no international copyright laws, allowing American publishers to offer stories published in England or France almost immediately after their initial publication abroad. Uncle Sam (1841-1856), published by Edward, Henry, and George Williams, was the first paper to run at least one original story by an American author in every issue. Frederick Gleason would take this one step further in the Flag of Our Union (1846-1870) by publishing fiction written by and about Americans exclusively. Advertisements and news items would become increasingly rare in these papers, with publishers relying almost exclusively on subscriptions for their revenue. Papers like the Flag are considered by scholars like Mary Noel to mark the dawn of the “true story paper" era. New York Ledger ; vol. 14, no. 48, featuring the first installment of E. D. E. N. Southworth's The Hidden Hand. Probably the greatest story paper was Robert Bonner's New York Ledger (1855-1903), which had a steady circulation of 400,000 at its height in 1859. The Ledger not only did better than other story papers, but far outpaced any other periodical in the country. It became so successful, in fact, that contemporaries credited its publisher with inventing the story paper format, even though Bonner made few real innovations himself, except on the business and advertising end of things. For a number of years, the only significant competition for the Ledger was Street and Smith’s New York Weekly (1859-1910). (Street and Smith would ultimately outlast Bonner, becoming one of the most successful publishers of inexpensive fiction well into the pulp era.) The success of Bonner and Street and Smith ultimately led to the “great story-paper flood” of the 1870s, which saw dozens of papers that attempted to capitalize on the popularity of the format. 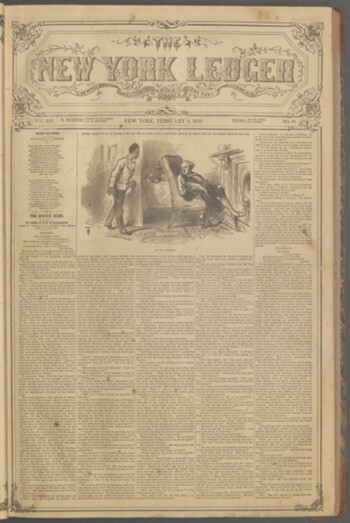 Although story papers would continue to be published alongside dime novels and other formats of cheap fiction for several more decades, the format peaked in popularity in the early 1880s. The earliest pamphlet novels appeared in the 1840s when Brother Jonathan (1839-1848) and the New World (1839-1848), two competing mammoths, began issuing “extras.” These were complete novels in paper covers that were offered at low prices, often between 6 ¼ and 25 cents, selling as many as 20,000 to 30,000 copies within the first few weeks of publication. Conventional publishers responded with aggressive price competition and by lobbying the Post Office to increase the cost of mailing pamphlets, which temporarily put a stop to the extras. The format would be revived a few years later when Gleason began offering his own pamphlet novels. His greatest success, Maturin Murray Ballou’s Fanny Campbell; or the Female Pirate Captain (1845), would sell more than 80,000 copies in the first three months alone. Brother Jonathan for Christmas, and New-Years 1854. Digital Library@Villanova University. The New York ledger ; vol. 14, no. 48. Nickels and Dimes. Mary Noel. Villains Galore: The Heyday of the Popular Story Weekly (New York, Macmillan, 1954). Matthew Short and Demian Katz. "Story Papers and Pamphlet Novels, 1830-1860" in The Oxford History of Popular Print Culture, v. 5. Forthcoming 2018. Raymond Howard Shove. Cheap Book Production in the United States, 1870 to 1891 (Urbana: University of Illinois Library, 1937).